Scientists battling to conserve a Tudor warship have developed a method to prevent sulfuric acid forming inside its wooden structures using iron-attracting nanoparticles that can be applied and recovered using a magnetic field. 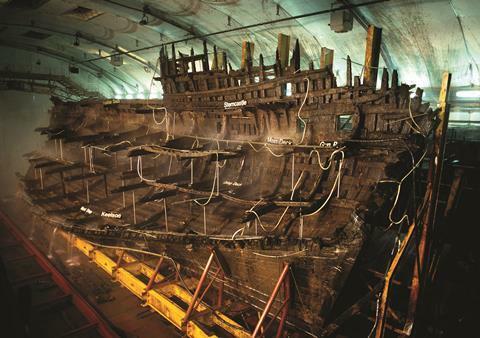 The Mary Rose’s wooden hull was preserved for centuries under layers of silt on the seabed after it sank in 1545, but since being recovered preventing the timbers from degrading has been a constant challenge. Much of the wood has been impregnated with the polymer polyethylene glycol to physically strengthen it, but chemical changes are also putting artefacts at risk. It was recently discovered that iron sulfides inside the wood were oxidising to sulfuric acid, which can cause discolouration. These compounds accumulated because of the action of sulfur-reducing bacteria on the seabed that produced hydrogen sulfide, which reacted with iron from the ship’s cannons and other metal parts. ‘We’ve tried different treatments before to try and neutralise [the acid], but this usually ends up with the material remaining within the wood which is not ideal,’ says Eleanor Schofield, head of conservation at the Mary Rose Trust, who was speaking at the at the 256th American Chemical Society meeting in Boston, US. Working in collaboration with researchers at the Universities of Glasgow and Birmingham in the UK, the Trust has been developing ways to remove iron ions from inside the wood in order to stop the acids forming. ‘We’ve been taking magnetic nanoparticles and functionalising them – so adding on receptors that will capture iron,’ says Schofield. These include porphyrin and pentetic acid. The nanoparticles can be moved using a magnetic field, ‘so we can drive the treatment in, but also drive it out and get those things out of the wood’, she adds. Embedding the nanoparticles in a thermoresponsive polymer, which is a gel above 22°C but liquefies when cooled, allows the treatment to be easily applied in liquid form then turned to gel and peeled off once magnets have been used to pull it back out of the wood. The technique hasn’t yet been tested on timber from the Mary Rose, but the researchers have shown that it works in principle using modern wood that has been soaked in iron sulfate. Using nanoparticles functionalised with porphyrin to trap iron they showed they could get around 85% of the iron out of these wood samples within 10 hours.